Shorecrest has partnered with New Oasis International Education to help recruit and house international students at Shorecrest. New Oasis homestay is not about renting a room in an American house, it's about joining an American family. By saying "yes" to the experience, we can foster a global understanding. When will students arrive? Generally, a week to 10 days before school starts. Where are the students coming from? Mostly from China. Will the students speak English? Ideally, yes, however keep in mind that improving their English and becoming cross-culturally competent is one of the major reasons for attending high school in the US. What about family vacations? If you are open to allowing the student to travel with you that can be worked out on an individual basis. We will have respite care available as well. Everyone over the age of 18 has to complete a background check. If approved, New Oasis will welcome into our host family community. All natural parents of our students must approve of the match before a selection is confirmed. To learn more please download this information and contact Dr. Jean Spencer-Carnes in the Shorecrest Admissions Office at jcarnes@shorecrest.org or 727-451-7511. Hear what Chargers have to say! 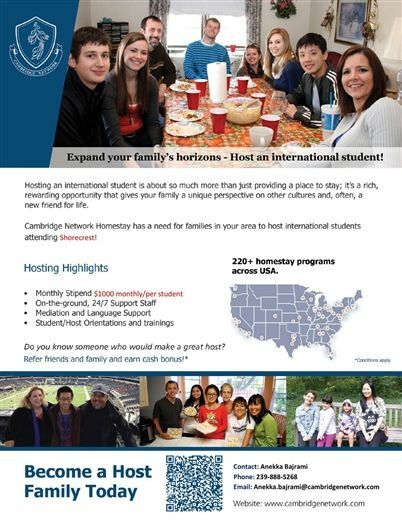 Read about the Epstein family's experience hosting an exchange student here.